It’s important to be aware from the start that the Red Ear Sunfish for aquaponics is not the same as the ocean sunfish. Creating a red ear sunfish aquaponics system is a great idea; providing you know the right approach. The red ear sunfish live in freshwater and originates from the Southeastern United States. In appearance, it is similar to the bluegill although it is generally larger and has a dark olive green hue that fades to light green and silver on the sides. You’ll also notice vertical bars across its body; although these are usually faint. Its preferred habitat is quiet water, such as lakes, ponds, and streams. The red ear sunfish also likes to have logs and vegetation in the vicinity; for feeding and hiding. The red ear sunfish is surprisingly hardy. It can cope in temperatures between 65°F and 89°F. Although they can spawn in these temperatures, their preferred range is between 70°F and 75°F. 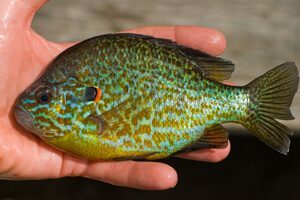 If you’re hoping to spawn your red ear sunfish you’ll need water that is between 1 foot and 5 feet deep with enough debris that the male fish can make a shallow depression. Of course, you shouldn’t just monitor the temperature of your red ear sunfish aquaponics system, the pH and ammonia levels are equally as important. Your tank should maintain a pH between 7 and 8.5, while the ammonia should be less than 0.01mg/l. It won’t do any harm to check the dissolved oxygen levels and make sure they are between 4 and 10 mg/l. The first few days of a red ear sunfish’s life is spent eating the yolk sac. They will then move onto microscopic animals known as zooplankton. Within a few weeks, the fingerlings are approximately 3 inches long and feeding on much larger prey. Ultimately, if you’re raising red ear sunfish in aquaponics, you can expect them to reach 12 inches long; they can be as heavy as 2 pounds. You’ll need to allow for this when calculating the number of fish your system can handle. 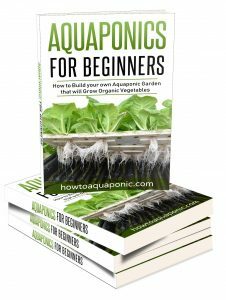 The speed at which they grow and the final size will depend on the size of your red ear sunfish aquaponics system and whether they have any competition for food. They should be fully grown within two years. Can You Combine Sunfish With Other Fish? Red ear sunfish are part of the sunfish family which contains a large number of different species. In general, the red ear sunfish is very tolerant of other fish, especially if they are a similar size or bigger. However, if you overstock your tank then the red ear sunfish are likely to have stunted growth and will become aggressive at feeding time. Providing the other fish you introduce are of a similar size it is unlikely that you’ll have an issue with them co-habiting. It is worth noting that if you’re using red ear sunfish as prey for other, larger, fish then you will need a third type of fish, the aggressive nature of the red ear sunfish will prevent the predator from feeding properly. Red ear sunfish may not be the first fish that comes to mind when you’re considering an aquaponics set-up. However, they are hardy and do eat snails and other small aquatic insects. 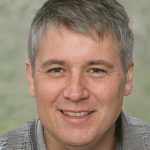 This can really help to reduce the likelihood of fish disease which can really damage your whole system. Of course, red ear sunfish will also provide the nutrients you need for growing vegetables and they can look great while doing it. What’s The Best Place To Put Red Ear Sunfish? There are many different types of aquaponics system but one of the best for red ear sunfish is the floating raft system. The red ear sunfish are perfectly suited to swimming below the rafts and clearing up the debris that enters the water, particularly snails. In the famous UVI system these kinds of fish are used to get rid of the snails under the rafts. This means the nutrients the plants need are readily available to them. However, it is important to have a predator or two in the tank; this will prevent the sunfish population from exploding. Red ear sunfish are often referred to as “shellcracker” because they have the ability to feed on aquatic insects, small fish, and snails. This is actually beneficial to your red ear sunfish aquaponics system as the amount of fish parasites is reduced. How big do sunfish get? Full grown they can reach 12 inches, providing your tank is big enough to accommodate them and their friends. Red ear sunfish are not generally kept in order to be eaten. However, they are fantastic at getting rid of snails in your system while generating nutrients for your plants. This makes them a great bet for any setup; especially as they need very little attention. How long do sunfish live? On average a red ear sunfish will live to 7 years old in your tank. In the wild, they will usually only live to 6, although some have survived to the age of 8. It is possible to get these fish in your local fish/pet store. However, it is probably better to check out a red ear sunfish aquaponics expert in your area and purchase fish for them. Not only should you be assured of quality fish, but you’ll also be able to pick up a few extra tips to help you make the most of your fish and your aquaponics setup. If you wish you can even get the eggs from a hatchery and then hatch them yourself. The final option is to look online where many people can sell you the fish you’re after. 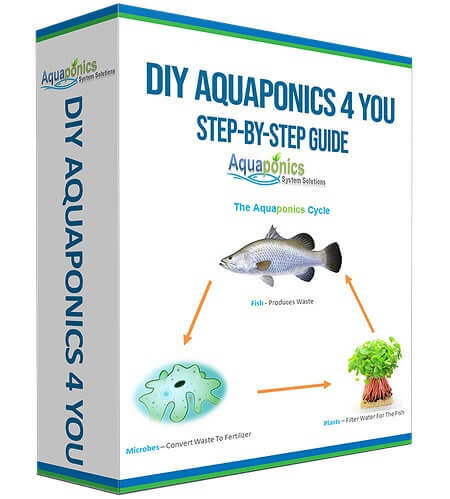 However, you need to check how they will be shipped to ensure the fish that arrive are suitable for your red ear sunfish aquaponics system.